Hahndorf and Mount Barker are located just 7 kilometers apart, yet each has a completely different offering for visitors. Hahndorf has come a long way since Captain Dirk Hahn helped to settle the region's first European inhabitants here back in 1839. These settlers were fleeing from religious persecution in Prussia (north-eastern Germany). A little over 175 years later Hahndorf is a State listed Heritage Town, and has retained its strong German heritage and feel. Hahndorf is conveniently located just 30 minutes from Adelaide via the South Eastern Freeway, with the Handorf exit clearly marked. great family activities such as animal interaction at Hahndorf Farm Barn and strawberry picking at Beerenberg Farm. The Paech family who established Beerenberg Farm were among Hahndorf's first settlers and farmers. Today they still grow the fruit that goes into fine jams, marmalades and condiments. Alongside traditional recipes there are new flavours to entice taste buds and few people leave their Farm Shop empty-handed. Picking strawberries here is a much-loved event and the season runs from mid-October to April. Always check their website here to see if the patch is open for picking. 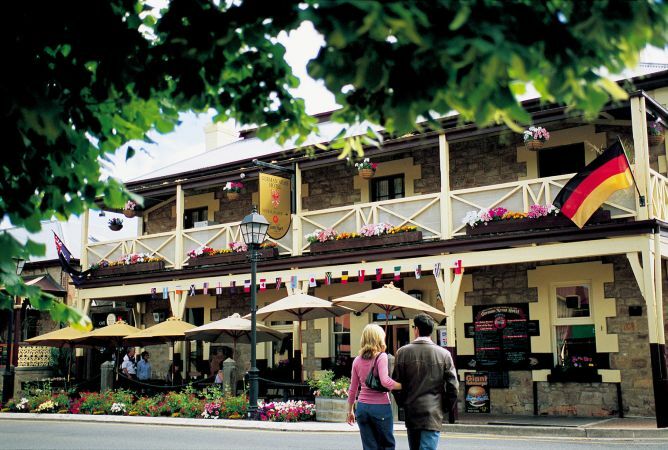 More detailed information about Hahndorf can be found here. For more information visit the Hahndorf Business and Tourism website or refer to the Hahndorf brochure and map (also available from the Adelaide Hills Visitor Information Centre). Hahndorf can be reached from Adelaide by public bus - see routes 864, T843, 841F, 860F at the Adelaide Metro website. 39 kilometres from Adelaide and just a ten minute drive from Hahndorf is Mount Barker, a thriving residential, commercial and service centre of excellence for the Adelaide Hills. Here you will find a state of the art cinema complex, caravan park, linear trails, recreation parks, sporting complexes, swimming pool, restaurants, pubs, cafes, playground and skate park, golf course and all the services that you may need while on tour. The Mount Barker Linear Trail which runs around Laratinga Wetlands and beyond is popular with walkers and cyclists. Several trails and boardwalks wind around the peaceful wetlands near Mount Barker, through a broad range of native vegetation. Trails such as the ‘Chestnut Teal’, ‘Rosella’ and ‘Sacred Ibis’ are named after some of the local bird life. There are also several bird-watching ‘hides’, a picnic and barbecue area, and an environmentally friendly toilet facility. The trails in the wetlands are also linked to the Mount Barker Linear Trail, an award winning seven kilometre shared trail from Laratinga Wetlands to Keith Stephenson Park, following the local creek line. Mount Barker Summit offers panoramic views of the district. Adelaide Hills Farmers Market is open every Saturday morning (8:30am-12:30pm) in Mount Barker with stallholders offering fresh, seasonal and local products. Reduce your food miles and get to know what the Adelaide Hills has to offer with a great range of produce and tasty treats to choose from. Held twice a year, Penny Lane Market in Mount Barker offers an excellent selection of high quality arts and crafts, clothing, accessories, home decor, baked goods, plants and much more. SteamRanger Heritage Railway, which runs at selected times throughout the year between Mount Barker in the Adelaide Hills and Strathalbyn, Goolwa and Victor Harbor on the Fleurieu Peninsula. A must for families and train buffs. Historic Wallis Auchendarroch House a local landmark and has excellent facilities for corporate events, weddings and other social functions. Within the complex is the Wallis Tavern and Wallis Mt Barker Cinema, a state-of-the-art cinema complex. Historic Gawler Street in Mount Barker offers an abundance of dining options from pubs, bakeries, cafes and restaurants - all interspersed with great little shops including homewares and clothing. A handful of wineries in and around Mount Barker including Ngeringa, By Jingo! Wines and Howard Vineyard (Nairne). Keith Stephenson Park with playground, picnic facilities and a skate park. Mount Barker can be reached from Adelaide by public bus - see routes 864, T843, 860F, 840X and T840 at the Adelaide Metro website. There is also a loop that runs between Hahndorf and Mount Barker (HL1 and HL2).